At this year’s Frankfurt Musik Messe exhibition Numark announced their latest product, the DDS80 – a rack-mountable digital music player that is perfect for mobile DJs who want the ability to play from CDs, hard drive, iPod, USB sticks, and infact nearly any USB compatible digital media. The DDS80 is a powerful next-generation DJ system comprising of two rack-mountable components: the DDS and the DDS Drive. The DDS is basically an upgraded version of Numark's D² Director but complete with the colour screen that debuted on the iDJ2. It’s feature set includes pitch-shift, key lock, scratch, loop, lightning-fast track look-up and Numark’s popular ‘Crate’ feature. 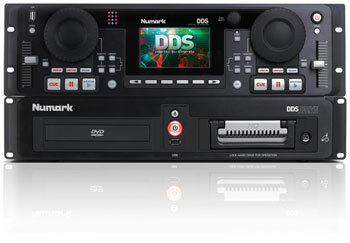 The DDS80 also includes Numark's DDS Drive media rack, which includes a removable and upgradeable 80GB hard drive and a DVD/CD-ROM drive. Other USB storage devices can also be connected and the device can be hooked-up directly to a computer, allowing quick and easy transfer of a music library to the internal hard drive. Once again Numark have delivered a unique and innovative product that is sure to perfectly meet the needs of many DJs who want to be able to play music from a range of media formats.